How does magic work in this universe? We know Spellslingers mix the arcane arts with high technology, but I have also seen Elementalists, Arcanists, and even Mages, whom carry staves. Most, if not all, being mobs. Are they canon? If so, is there any lore on them? How is the Void connected to any of this? https://www.reddit.com/r/WildStar/comments/23astp/lore_how_does_magic_work_in_wildstar/ - I found this (a bit old) that has some information on it! 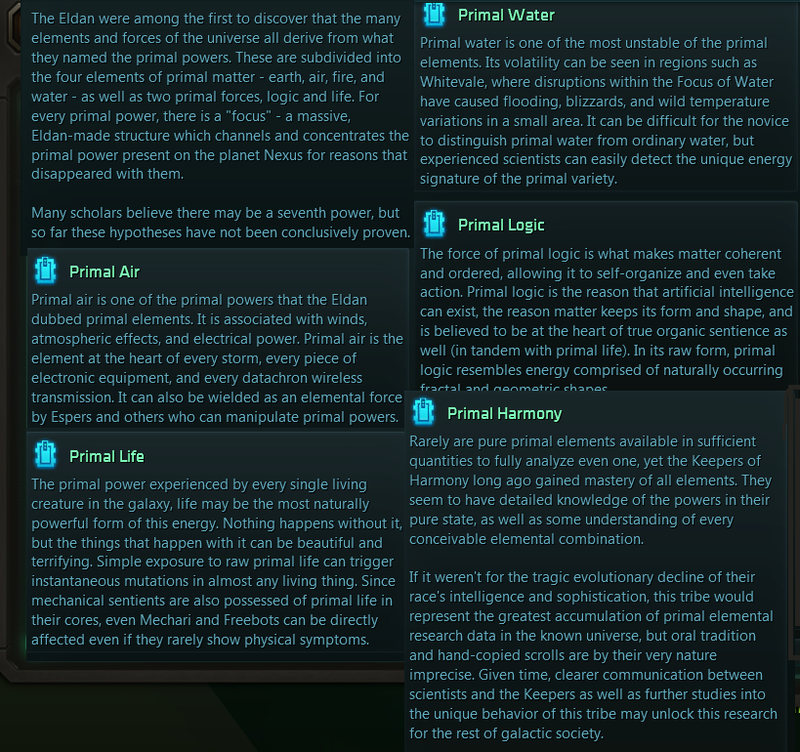 There is magic in Wildstar, and most things in the universe work on the "primal elements" - Fire, Water, Earth, Air, Life, and Logic. These are also used through science - Wildstar is very free with playing with the boundaries of science and magic. Mordesh are a race of alchemists. Aurin talk to trees. Draken practice blood magic. The Void is kind of seperate and more mysterious than all of them and less defined - I'll try and get someone from the Discord who knows more than I do on that! Correct me if I'm mistaken, but I think most/all magic boils down to manipulating the elements (water, fire, air, earth, life, logic) into Doing Stuff in specific ways, usually by using an object as a focus and/or enhancer of energies, which would explain the staves. Manipulating the Primal Elements is possible yeah, like said above you need a focus and that's the most important part. Kind of like how guns are the focus for spellslingers to channel the void, or Psyblades for Espers to use espernetics, It would also help to your have character heavily leaned towards one of the elements in their primal pattern. The Wiki says this: The manipulation of primal energies is oftentimes called "magic." Not every race has the ability to manipulate primal energy, and even then, most require some form of focus or reagents to aid them in their technique, such as Draken and their spellslingers using pistols to cast magic. The Primal Elements are the forces of magic that are found in everything. On Nexus, they can be found purified and running rampant on their own in their own unique forms, such as the goddess Vitara who was an Eldan experimentally infused with Primal Life. The elements are especially dangerous when purified and can fuse themselves with things they come in contact with that are reactive to them. Of the elements, fire, water, earth, and air are pretty standard and concrete. You know these elements well in the fantasy setting and their use is pretty easy to figure out. Life and Logic are far more complicated. Primal Life is present in all living things. It is responsible for the bodily processes that allow an organism to live, and is also present in aging and life-cycles. Pure Life tends to fuse with organisms and causes extreme growth, physical mutations, and even immortality. Accelerite crystals; infused with high concentrations of Life, can speed up bodily processes so much that a person is able to run at superspeed. Life is what makes up nature. Life is extremely chaotic and random. Logic on the other hand is the element present in science and technology. It is present in structure, order, and all machines. Pure Logic fuses with machines and catalysts such a large concentrations of Omni-plasm, and can alter chemical structure and do other weird machine things. So TL;DR is kind of that 'magic' and 'technology' in Wildstar's universe aren't really separate things? That primal elements/life/logic are the energies that underpin all matter, and the biggest difference between magic and technology is the means by which those energies are manipulated? There is tons and tons of good lore in-game that can help you. I have all the lore, but I don't want to spam this thread with a large collection. Hahaha. I'll post a small bit. I know elementalists exists. They can be seen near and around Hivestrike Grove in Aurora. It is said Ikthians are the only ones who have a firm control over water. I am still looking for that information in the lore list in-game. Edit: Laz, if you want more screenshots and such, I can send them your way privately. "It can also be wielded as an elemental force by Espers and others who can manipulate primal powers." Espers are unique in that they are able to use magic/primal power mental power without the use of a special device because the source of their power is their own mind. The psyblade allows them to focus that magic into psyblade constructs for more accurately offensive and defensive applications. You will want to note; however, that the inclusion of Espers in society especially in the Dominion is relatively recent and followed the discovery of Nexus. Espers were mistreated and feared for a time until they became necessary and official training was integrated. I can't figure out where that lore was but it exists somewhere...it was 2 years ago sue me. What I CAN confirm is that Espers cannot read minds, control thoughts, or manipulate objects telekinetically. They don't do any of those things you'd expect from a psy class. Their abilities are entirely based on energy constructs that are very real and very hurty. That blue glowing sword summoned by the Esper's mind? It is actually there and it will actually behead you. They are effectively the Green Lanterns and can construct pretty much anything they have concrete perception of. My Esper uses his powers to construct tools and support equipment he needs to build housing for underprivileged lowborn.